This fixes folder browsing in 32-bit mode, improves and speeds up file support, and fixes rare crashes. Just updated.. no mkv files were showing up, and even after a reinstall and clean installation the same issue. Rolling back to the previous version. 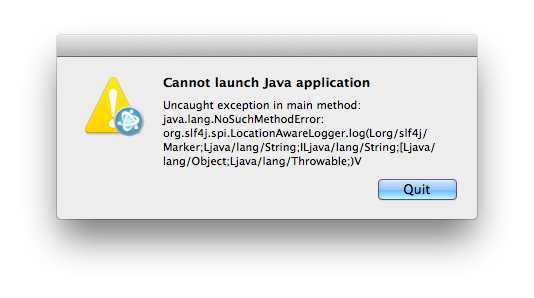 After installing, I got the following error window when trying to launch UMS. Any help? I wasn't so much looking for help here (since there is a help section) just passing on a potential bug head's up. I saw the update announcement on facebook, and installed it. I couldn't see any mkv files, so I reinstalled it using the clean option, thinking it might be something new and required. I saw the same behavior, so I figured I'd roll back to my previous install, which I though was a2. After installing that, I saw the same thing on our ps3, so I figured it might need restarting.. no luck there. I then rolled back further to a1, and that resolved the problem. Did A1 have the resume playback option added to it? If not, I was running a2 before this update. I'm back again on the 3.0.0-a1 ))) It's perfect!!! Seems to be working great on my OPPO 93. Every Version of 3.0.0 never shows me any media renderer and the PS3 or the televisions don´t find the ums. 2.6.5 works without any problem. if you need any logs or something please tell me what you need and i will try to give it to you. DEBUG 2013-07-14 20:18:16.353 [main] Reading cred.path: default: "", current: "C:\ProgramData\UMS\UMS.cred"
DEBUG 2013-07-14 20:18:23.172 [main] Reading maximum_bitrate: default: "110", current: "0"
DEBUG 2013-07-14 20:18:24.239 [main] Reading folders: default: "", current: "\\BREITAG-SERVER\Bilder,\\BREITAG-SERVER\Filme,\\BREITAG-SERVER\Musik,\\BREITAG-SERVER\Serien,\\BREITAG-SERVER\Videos"
INFO  2013-07-14 20:18:31.347 [main] Please wait while we check the MPlayer font cache, this can take a minute or so. DEBUG 2013-07-14 20:24:30.382 [AWT-EventQueue-0] Reading dbgpack: default: null, current: "channels\channel.log,C:\Program Files (x86)\Universal Media Server\channels\channel.log"
DEBUG 2013-07-14 20:24:56.254 [AWT-EventQueue-0] reloading. INFO  2013-07-14 20:30:03.594 [main] Please wait while we check the MPlayer font cache, this can take a minute or so. INFO  2013-07-14 20:30:06.338 [main] Finished checking the MPlayer font cache. INFO  2013-07-14 20:30:06.341 [main] VSFilter / DirectVobSub was not found. This can cause problems when trying to play subtitled videos with AviSynth. I really like ums and every version was working until you release the 3.0.0 betas. I hope i don´t have to stay at 2.6.5 because any higher version is not showing any renderer. With a Sony Bravia 5500, no rendering is working with UMS version > 2.6.4 for any kind of video file with any transcoding engine after a time out of 10 seconds. Can i install this over my 2.6.5 install, in a separate folder?